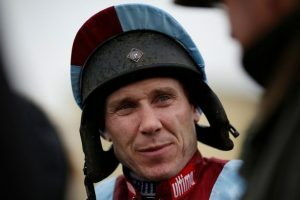 Richard Johnson rode his first winner, Rusty Bridge, at Hereford in 1994 and was Champion Conditional Jockey in 1995/96, the same year that A.P. McCoy became Champion Jockey for the first time. Thereafter, Johnson was involved in a perennial – and, while amiable, ultimately losing – battle with the Northern Irishman for the jockeys’ championship until his retirement in 2015. McCoy went on to become Champion Jockey a record 20 consecutive times, with Johnson finishing runner-up to his nemesis on no fewer than 16 occasions. However, Johnson who, at the time of writing, recently reached the landmark of 3,500 winners when He’s A Goer won a novices’ hurdle at Warwick, was Champion Jockey for the first time in 2015/16 and collected the jockeys’ championship trophy for the third year running at Sandown Park at the end of the 2017/18 season. While acknowledging the ambitions of younger jockeys – not least Harry Skelton who, at the time of writing, lies second in the Stobart Jump Jockeys’ Championship – Johnson, 41, has described the absence of his great friend, and former great rival, A.P. McCoy, as a ‘bonus’. Johnson still has some way to go to catch McCoy as the most successful National Hunt jockey of all time, but appears to be riding at least as well, if not better, as he has at any point during his phenomenal 24-year career. In the last three seasons, he has averaged exactly 200 winners on British soil and, with 118 to his name already in 2018/19, a fourth consecutive jockeys’ championship title looks a distinct possibility. Of course, in March, 2018, Johnson won the Cheltenham Gold Cup, for the second time, on Native River, trained by Colin Tizzard, adding to his previous victory aboard Looks Like Trouble, trained by Noel Chance, 18 years earlier. Other career highlights at the Cheltenham Festival include Anzum in the Stayers’ Hurdle in 1999, Flagship Uberalles in the Queen Mother Champion Chase in 2002 and Rooster Booster in the Champion Hurdle in 2003. However, the Grand National, in which Johnson has ridden 20 times, without success, remains elusive, although he did finish second in the world famous steeplechase on Balthazar King in 2014.